Pretzels with a twist - the combination of a salty pretzel hand-dipped into our chocolate is mouth-watering. 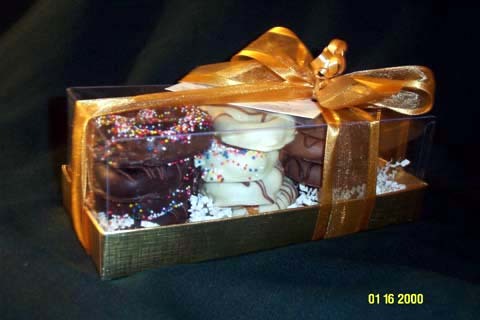 12 assorted hand-dipped pretzel twists in a gold box. A seven sectioned copper tin filled with 4 oz. of each your favorite candies. Included in tin: Mixed Nuts, chocolate covered raisins, chocolate expresso beans, chocolate covered almonds, Pistachios, Liquorish pastels, & Jelly Belly Jelly Beans.